Pancakes on Shrove Tuesday came about because of Lent. Traditionally families ate as much rich food as they could before fasting over Lent, and pancakes were easy to make from the four most common ingredients in a household – eggs, sugar, flour and milk (fat). There are plenty of traditions associated with the day. 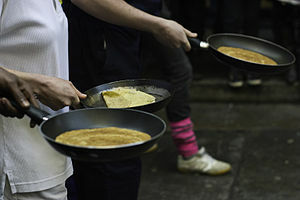 Somewhere in the UK there is a pancake race being held, probably in your child’s school, maybe in the high street of a small village in the middle of Somerset. I think it will be a sad day when health & safety expunge the tradition for fear of tripping over ones shoe lace whilst holding a frying pan but I expect it’ll happen at some point. We live in a world where the possibility of getting a claim in means that somewhere someone has already examined the pancake race in minute detail to identify where all the risks are, all because there is a possibility of having a pancake covered face. But before the red tape monster get there it’s time to get those frying pans out and make some pancakes. There’s a simple recipe for pancakes in my previous post about Pancakes. This year we’re having some pancakes rolled with Raspberries, some with chocolate sauce and the rest with golden syrup. If you don’t fancy making pancakes and you have a waffle iron then you could make waffles. You will avoid the possibility of pancakes stuck to your ceiling or scattering across the floor, all of which are part of the fun element, but they are quick and simple to make. All you need do is add the necessary ingredients to turn it into waffle batter [I’ll have to experiment and post a recipe], there are plenty of recipes out there though if you need one. If you’re using a waffle iron remember to brush a little oil over the surface to stop the batter from sticking to the surface after each batch. I’m going to add some cinnamon to the pancakes we’re having with chocolate. This entry was posted in Special Occasions and tagged Frying pan, Golden Syrup, Lent, Pancake, pancake race, Raspberries, recipe for pancakes, Shrove Tuesday, waffle iron. Bookmark the permalink. I did not know this existed until this year. Where have I been? God, I love the UK and their traditions! There seems like a trillion holidays coming up all over the place in the next week. Today is The Chinese New Year-Year of the Dragon, and on the 12th of Feb. is Shrove Tuesday. This is a great article about Shrove Tuesday and how it evolved because of Lent from the great blog Fish, Chips & Mushy Peas.